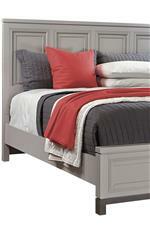 Crafted from poplar solids, this panel bed highlights transitional style and accommodating design. 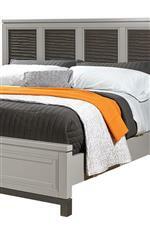 The bed features lamp assist touch lighting and showcases a beautiful four panel headboard design. 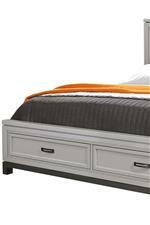 The footboard showcases two cedar lined drawers that present accommodating storage. Completed with a light gray paint finish, this bed presents elegant and accommodating design that will transform your bedroom setting. 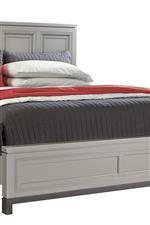 The Hyde Park Queen Painted Panel Bed with Storage by Aspenhome at Darvin Furniture in the Orland Park, Chicago, IL area. Product availability may vary. Contact us for the most current availability on this product. Storage Two cedar lined drawers. The Hyde Park collection is a great option if you are looking for Transitional furniture in the Orland Park, Chicago, IL area. Browse other items in the Hyde Park collection from Darvin Furniture in the Orland Park, Chicago, IL area.